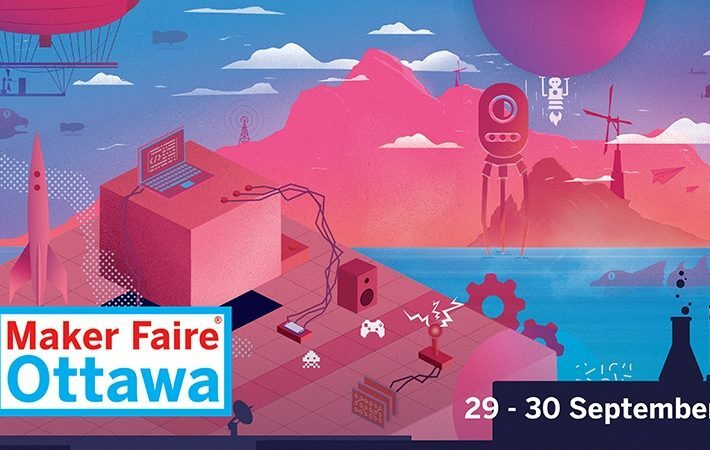 Maker Faire Ottawa, the ‘Greatest Show and Tell on Earth’, will be returning with its 2018 edition at the newly-designed Canada Science and Technology Museum – one of three museums under Ingenium – on September 29th and 30th, 2018. The event is the National Capital’s showcase of the best in DIY talent in science and technology, engineering, microelectronics, robotics, 3D printing, agriculture, arts and crafts, and much more. We are thrilled to announce that Jon Sarriugarte and his Empire of Dirt team – of Burning Man and La Machine France notoriety – will be joining us to captivate attendees with their hand-forged ‘Serpent Twins’ and ‘Electrobite’ mobile sculptures. These impressive machines will treat crowds to mind-blowing light and sound shows and will be on-site for the full event to interact with guests. Attendees will be treated to a weekend of innovative thinking, inventions, inspiration, creativity, and resourcefulness that is guaranteed to impress Makers and enthusiasts of all ages. Joining Faire alumni such as the R2D2 Builders Club and ParLUGment Lego Group are exciting new participants like Doug Pengelly and his 40′ LEGO cable-stayed bridge; the TinCan Project’s mobile wetplate darkroom & ultra-large scale camera housed in a refurbished 1974 Ford P400 step-van; Merge Robotics and their team of 45+ local high school students who created a 120-lb robot to compete in a 3-on-3 game challenge; and many more workshops and exhibits that promise to set your imagination soaring. There are still a few spots left to be a part of the action! Makers who want to participate in this exciting event are encouraged to submit their applications through the Maker Faire Ottawa website. We call it the Greatest Show & Tell on Earth. Maker Faire Ottawa is part science fair, part county fair, and entirely fascinating! As a celebration of the Maker Movement, it’s a family-friendly showcase of invention, creativity, and resourcefulness. Faire gathers together tech enthusiasts, crafters, educators, tinkerers, food artisans, hobbyists, engineers, science clubs, artists, students, and commercial exhibitors to showcase their creations and share their learnings. Attendees flock to Maker Faire to glimpse the future and find the inspiration to become Makers themselves. Established and opened in 1967 as a Centennial project, the Canada Science and Technology Museum is responsible for preserving, promoting, and sharing knowledge about Canada’s scientiﬁc and technological heritage. After undergoing an $80.5-million renewal of its entire building, the Museum reopened its doors on November 17, 2017, marking its 50th anniversary during Canada 150 celebrations. It features over 7,400 m2 (80,000 sq. ft.) of redesigned exhibition space, including an 850 m2 (9,200 sq. ft.) temporary exhibition hall to accommodate travelling exhibitions from around the world. Museum Highlights: 11 new exhibitions with the capacity to showcase international travelling exhibitions from around the world. Long-time visitor favourites, the Crazy Kitchen and locomotives are also back in addition to the Game Changers travelling exhibition, Artifact Alley, a Children’s gallery, a demonstration stage, classrooms, and the Exploratek maker studio.